When Jurassic World opens in theaters on June 12, viewers will find Chris Pratt in Guardians Of The Galaxy mode, playing the kind of action movie badass who only has time for a few one-liners before getting back to riding motorcycles and gunning down genetically modified dinosaurs. 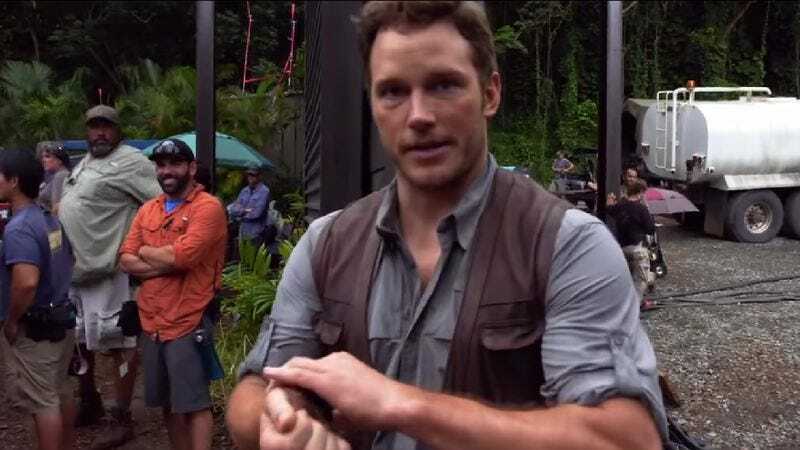 If this behind-the-scenes video is any indication, however, the Jurassic World crew was treated to Chris Pratt in Parks And Recreation mode, as he delighted one and all with his lovably goofball antics. The video is ostensibly about the stunt work on Jurassic World, and there are indeed shots of Pratt recoiling from an explosion and sliding under a truck. (The final version of that particular stunt can be seen in the movie’s global trailer.) More notable are the glimpses of people in the background, from camera operators to Bryce Dallas Howard to men of undetermined occupation in orange shirts, who cannot help but crack up as Pratt gyrates and cracks wise for their amusement. Oh, Chris Pratt, what hyper-intelligent super T-Rex could steal the scene from you?